One can only hope that Sky News run with this like they did with Madeleine McCann (not literally) but with a more successful outcome. That’s probably the only way that the Hoff will be found. However – and here’s a note to people up and down Ecclesall Road whose Hoff has been stolen – it would be more helpful if the posters in the window actually detailed exactly how we could help. What exactly do you need us to do? Further information surrounding his disappearance would also be of assistance: When did it happen? Had he been drinking? Did you note any suspicious characters around? Did he leave his orange shorts? And have you informed the police (other than by way of handwritten posters in the front window)? 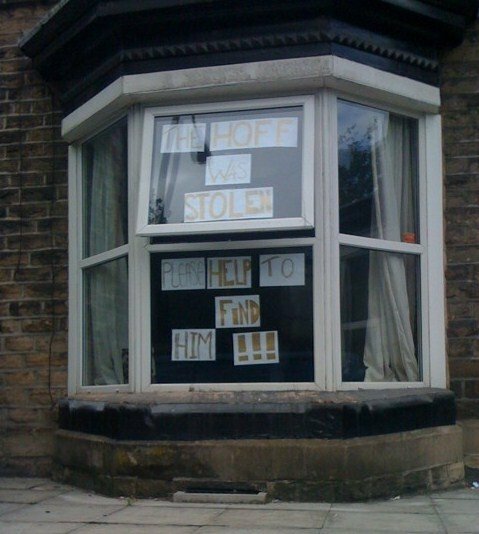 I’m sure we all hope that the Hoff is recovered soon and will watch the front windows of Eccy Rd for further updates. Afterthought: Just noted that it actually states “the Hoff was stolen”. Perhaps this is some admission that the Hoff, who presumably used to be in their possession was actually not their Hoff to begin with. Or something. Next Next post: Are The Killers coming?